Media - Erin M. Jacobson, Esq. Below you will find media interviews and articles featuring Erin. Erin M. Jacobson, Esq. (www.themusicindustrylawyer.com) is an experienced deal negotiator and a seasoned advisor of intellectual property rights who protects musicians, songwriters, music publishers, record labels, and a wide variety of other music and entertainment professionals. Ms. Jacobson’s clients include Grammy and Emmy Award winners, legacy artists, and independent artists and companies. Ms. Jacobson regularly handles all types of agreements within the music industry, with an emphasis on music publishing and licensing. She is a frequent author and speaker, and has been featured in Forbes and Music Connection. Outside of her law practice, Ms. Jacobson also owns and operates Indie Artist Resource (www.indieartistresource.com), the independent musician's resource for legal and business protection. Indie Artist Resource offers high-quality, affordable contract templates most needed by independent musicians. Music Industry Cases and Issues to Watch in 2018 ~ Erin M. Jacobson, Esq. Erin M. Jacobson, Esq. summarizes her Forbes.com article of the music industry cases and issues to watch in 2018. Erin M. Jacobson (www.themusicindustrylawyer.com) is a practicing music attorney, experienced deal negotiator, and seasoned advisor of intellectual property rights. She protects clients ranging from Grammy and Emmy Award winners, independent and legacy artists, songwriters, music publishers, heirs and song catalogues, and other music professionals. Ms. Jacobson handles all types of contracts within the music industry, with an emphasis on music publishing and licensing. In addition, she is a frequent speaker and author, with articles featured on Forbes.com and in other publications. Ms. Jacobson also owns and operates Indie Artist Resource (www.indieartistresource.com), the independent musician’s resource for legal and business protection, offering high quality contract templates most needed by independent artists and writers. “Attention Legacy Artists: 6 Things You Need to Know to Recapture Your Copyrights” by: Erin M. Jacobson, Esq., Published on Billboard.com, January 22, 2019. “How Amazon’s Twitch.tv Cheats Music Creators” by: Erin M. Jacobson, Esq., Published on Forbes.com, July 31, 2018. Erin quoted in the Noisey/Vice magazine article, “How Easy is it for Businesses to Walk Away from Problematic Artists?”, May 11, 2018. 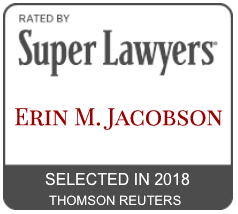 “Music Industry Cases and Issues to Watch in 2018” by: Erin M. Jacobson, Esq., Published on Forbes.com, December 8, 2017. USC Thornton School of Music features Erin in a panel on networking. Read the article here. Southwestern Law School congratulates Erin on the launch of Indie Artist Resource. Interview with Erin at Feel the Music In Your Soul. The Biederman Blog discusses Erin’s article,“360 Deals and the California Talent Agencies Act: Are Record Labels Procuring Employment? ”. The ASCAP Daily Brief and Chris Castle recommend Erin’s article ,“360 Deals and the California Talent Agencies Act: Are Record Labels Procuring Employment? ”. The Trichordist recommends Erin’s article ,“360 Deals and the California Talent Agencies Act: Are Record Labels Procuring Employment? ”.